Homegrown online marketplace Flipkart is all set to launch tablet with its own label on June 26. 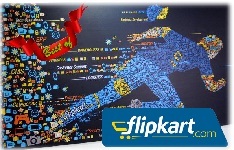 New Delhi: Homegrown online marketplace Flipkart is all set to launch tablet with its own label on June 26. The Bangalore—based firm, which sells its own brand of electronic and computer accessories, is expected to launch the tablet under the same label. While the specification details of Flipkart’s device still remain under the wraps, the company is hosting a blogger event on June 26 and has sent out a cryptic invite in form of a jar of tablets. The move is expected to help Flipkart, which follows the mix of marketplace and inventory—led model (with resellers putting up their wares for sale on the website) to boost its margins in the highly competitive electronics retailing space. Interestingly, last week online retailing giant Amazon had launched its first smartphone — Fire Phone —— becoming the first e—commerce firm to compete in the over USD 150 billion global market, led by players like Apple and Samsung. Amazon also has its Kindle range of e—Book readers. Flipkart’s move to launch a tablet is also expected to help the e—commerce firm connect faster with its consumers. Another similarity that Flipkart shares with Amazon is the annual membership fee—based service for its customers. Flipkart First, which is similar to Amazon Prime premium subscription service in the US, aims at rewarding registered shoppers, which the company claims are about 18 million for the portal, as well as getting new ones on board. Like Amazon’s ‘Firefly’, Flipkart’s tablet is expected to be integrated with features that will enable users to complete transactions with the firm that sells everything from apparel to household appliances to stationery within minutes. Firefly can identify things like books, games, CDs etc by pointing camera at them. It can also capture songs or TV programmes and gives the user options to purchase them. With this move, Flipkart will compete with global giants like Samsung and Apple, which are leaders in the domestic market too. However, going by tablet sales data, the growing demand for phablets is eating into the market share of tablets and it is yet to be seen how Flipkart markets its device to catch the consumer’s pulse. According to research firm CMR, the tablet sales in India declined 17.5 per cent to 0.75 million units in January—March 2014 compared to 0.9 million units in the same quarter last year, pulled down by higher demand for phablets (six inch smartphones) and BIS certification compliance issues. However, with the consolidation in the market (as many smaller players have discontinued their products), analysts expect sales to pick up in the quarters ahead.